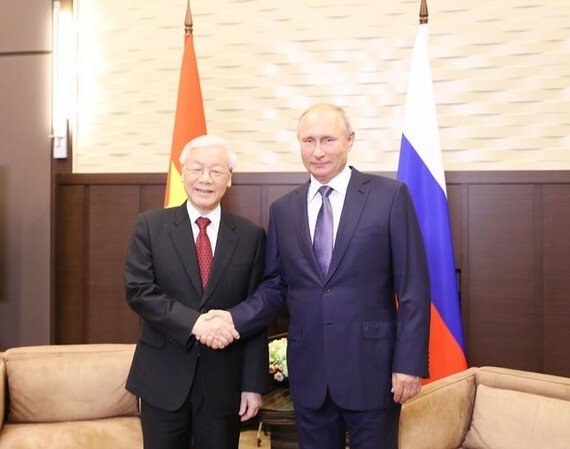 It is Vietnam’s consistent policy to take Russia as one of the most important and reliable partners of Vietnam, General Secretary of the Communist Party of Vietnam (CPV)’s Central Committee Nguyen Phu Trong reiterated during his talks with Russian President Vladimir Putin in Sochi city on September 6. Vietnamese people have always remembered the valuable support of Russia in the past as well as at present, he said. Trong spoke highly of the comprehensive achievements that Russia has gained over the past, as well as its important position in the global arena. Meanwhile, President Putin affirmed that Russia has always held Vietnam in high regards as a leading partner in the Asia-Pacific region. He said he believed that the ongoing official visit to Russia by Party leader Trong will create an important milestone and new driving force for the bilateral comprehensive strategic partnership. The two leaders expressed their pleasure at the comprehensive development in the bilateral relations over the past time. The sound traditional friendship between Vietnam and Russia has stood the test of time and been nurtured by several generations of leaders and peoples. Such valuable property should be maintained and promoted, they said. Amid the friendly atmosphere of mutual trust and understanding, the two sides focused discussion on major measures to create new momentum for bilateral cooperation in all fields. They agreed to exert maximum efforts to develop the bilateral comprehensive strategic partnership in a deeper and more effective manner. The two leaders together decided to maintain high-level delegation exchanges, political consultations, and strategic dialogues across all channels – including the Party, Government, parliament, agencies, ministries, departments, and localities. They agreed to reinforce political trust as a foundation to boost and expand all-around collaboration. Vietnam and Russia will jointly organise the Russian Year in Vietnam and vice versa on the occasions of the 25th anniversary of the treaty on the basic principles for bilateral friendship in 2019, and the 70th anniversary of the establishment of diplomatic ties in 2020. The two leaders said they are pleased with the rapid growth of bilateral ties in economy and trade, particularly after the free trade agreement between Vietnam and the Eurasia Economic Union took effect. They agreed to step up measures to capitalise on the pact. They noted that improvements should be made to the work of the Vietnam-Russia intergovernmental committee on economy-trade and science-technology cooperation in monitoring and implementing bilateral agreements and in seeking new joint projects related to energy, transport infrastructure, information, and telecommunications. Talking about cooperation in energy, oil, and gas, a strategic sector for bilateral ties for years to come, the leaders agreed to create favorable conditions for Vietnamese and Russian firms to effectively carry out their existing projects. They said there will be more new projects with the participation of national oil and gas companies from both sides. They agreed to facilitate the operation of prioritised investment projects in the two nations. The leaders of the two countries said they will both work on the issuance of encouragement policies and the simplification of procedures and criteria helping their products – particularly agro-forestry-fishery goods – find easier access to each other’s market. They considered it a good way to lift up bilateral trade turnover. They stated the two countries will continue their close and effective collaboration in defence-security, manifesting their mutual trust and in line with their comprehensive strategic partnership. The leaders reached an agreement to implement a project on building a centre for science and nuclear technology in Vietnam, considering it a key cooperation project concerning the use of nuclear power for peaceful purposes. They agreed to enhance joint engagement in education-trainning, culture, and tourism as well as to boost cooperation between Vietnamese and Russian localities. Trong and Putin exchanged their opinions regarding international and regional matters of common interests. They both supported the necessity of tackling conflict by peaceful measures without the use of, or threat to use, force and with respect to international law, particularly the UN Charter. Party General Secretary Trong stated that Vietnam backs Russia’s increasing role in ensuring security, peace, stability, and cooperation in the Asia-Pacific, Southeast Asia, and in the world. The leaders lauded contributions of Vietnamese expatriates in Russia as an important bridge for bilateral relations. The Vietnamese Party leader thanked the assistance of Russian leaders and public authorities towards the community. He expected further support will come to facilitate the life and work of Vietnamese expatriates in Russia in contribution to traditional ties shared between Vietnamese and Russians. He took the occasion to invite the Russian President to visit Vietnam in 2019. Putin accepted the invitation with delight.